Follow Current Knife Legislation for the most recent information. 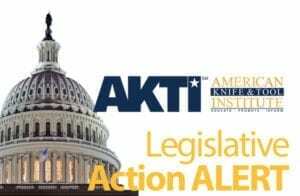 AKTI keeps close tabs on all legislation introduced in all 50 states and the federal level that could potentially affect your ability to make, buy, sell, own, carry and use knives and edged tools. We will alert you by email if and when we need you respond to help with emails, calls or letters. Many legislative initiatives only require contacting your representatives at certain times in the process. We will not nag you to contact them unless it is necessary to the legislative strategy. Sign up for the free Grassroots Supporter email alerts so you don’t miss any crucial information. Check News for the latest legislation updates. Type your state’s name in the Search Site box on the left to see if something is happening. We send email alerts based on which state you live in. Do your part in repealing or making reasonable knife law changes. Sign up as a Free Grassroots Supporter to receive any email notices of Action Alerts for your state. Act when get an Alert! CAUTION – We advise New Yorkers and travelers to the state, and particularly to New York City, to exercise extreme caution regarding your knives. To protect yourself, it is better to never have a knife showing (not even the clip) and to be conservative and only carry a knife you are certain is legal and in a legal environment. If you’re a retailer who has been contacted by law enforcement about the knives you are selling, don’t make a deal. Call AKTI and get more information. If you’re an individual arrested for carrying a one-hand opening knife and charged with a gravity or switchblade violation, don’t make a deal. Contact us for possible additional information, including a referral for an expert witness. If you have a knife with a clip showing New York City considers that an illegal open carry.